The Royal Marines (RM) is a highly respected military organisation and has one of the longest recruit infantry courses in the world at 32-weeks. RM training is pretty unique in that both officers and other ranks complete their initial training at the same venue, the Commando Training Centre Royal Marines (CTCRM), Lympstone in Devon. Non-Royal Marines personnel who have completed their initial training are not required to attend the RM recruit course; instead they must attend and pass the All Arms Commando Course (AACC), which is for both officers and other ranks. Stage 3: All Arms Commando Course (8-weeks). This article is divided into six sections for easier reading, starting with Section One which provides a background to Commando forces, aim of the AACC and gender. Section Two looks at entry standards and applications before moving onto Section Three which provides an overview of the latest iteration of preparation packages available to Commando aspirants. Section Four provides an outline of the course proper (the information most people are after) which looks at the various tests that must be successfully completed during, as well as at the end of, the course. The penultimate section looks at the training and units encountered during the AACC and finally Section Six provides some useful information about the AACC as well useful links to relevant websites. The British Commandos were formed during the Second World War (WW2) in June 1940, following a request from the British Prime Minister, Winston Churchill, for a force that could carry out raids against German-occupied Europe. Initially drawn from within the British Army, from soldiers who volunteered for the Special Service Brigade, the Commandos’ ranks would eventually be filled by members of all branches of the Armed Forces of the United Kingdom (Royal Navy, Royal Air Force and even the Royal Marines) and a number of foreign volunteers from German-occupied countries. During WW2 Allied soldiers travelled to Spean Bridge for Commando training at the Commando Training Centre established in 1942 at Achnacarry Castle (8 miles North East of Fort William, Scotland), and included British Commandos, US Army Rangers and soldiers from Canada, France, Netherlands, Czechoslovakia, Poland and Belgium. Commando aspirants would arrive at Spean Bridge railway station, load their kit bags on to waiting trucks and then speed march the 7-miles (11km) to the Commando Training Centre carrying equipment weighing 16kg (36lb) and personal weapon within 60 minutes; anyone failing was immediately RTU (returned to unit). Prior to arriving at Spean Bridge, recruits underwent basic fitness training at Wrexham to ensure that they stood a good chance of completing the march. Eventually the British Commandos would develop into 30+ individual units and four assault brigades, and serve in all theatres of war from the Arctic Circle to Europe and from the Mediterranean and Middle East to South-East Asia. Their operations ranged from small groups of men landing from the sea or by parachute, to a brigade of assault troops spearheading the Allied invasions of Europe and Asia. Royal Air Force Commandos: first of 15 units established in 1942. After the war (1946) most Commando units were disbanded, leaving just the Royal Marines 3 Commando Brigade. However, the present day Royal Marines Commandos, Parachute Regiment, Special Air Service, and Special Boat Service trace their origins to the original Commandos. The Second World War (WWII) Commando legacy also extends to mainland Europe and the United States: the French Naval commandos, Dutch Korps Commandotroepen, Belgian Paracommando Brigade and United States Army Rangers were all influenced to varying degrees by the British Commandos. After WWII the RMs decreased their establishment from “70,000 to 13,000 and settled into three broad functions of Sea Service, Commandos and Amphibious. 3 Cdo Bde based around 40, 42 and 45 Cdos retained the green beret. The Commandos served, usually under Army command in Palestine, Malaya and Korea.” (van der Bijl & Hannon, 1994, p.3). “In 1959 National Service ceased, establishment dropped to 9000 men but all members of the Royal Marines became commando trained.” (van der Bijl & Hannon, 1994, p.3). In 1961, the Army takes sole responsibility for Forward Observation (aka naval gunfire support) (van der Bijl & Hannon, 1994), see 148 (Meiktila) Forward Observation Battery. “In 1962 Army commandos reappeared when 29 Regt RA was converted into commando gunners.” (van der Bijl & Hannon, 1994, p.21; expanded on page 50). “In the 1960s, 29 Commando Regiment – a Royal Artillery regiment composed of Army gunners who had passed the All Arms Commando Course…” (Fowler, 2009, p.26). “The regiment was regrouped from around the world, and in 1962 the gunners were Commando-trained; in May of that year they received their green berets from the CGRM at a parade held to welcome 29 Cdo.Regt. RA to the Corps.” (Fowler, 1984, p.25). “From 1968 to 1971 59 Field Sqn. RE, as it then was, gave engineer support to 3 Cdo.Bde. RM; with the beginning of the withdrawal from ‘East of Suez’ in 1971 the unit was re-formed at Plymouth as 59 Indep.Cdo.Sqn., and made part of the brigade order of battle.” (Fowler, 1984, p.26). “In September 1969 41 Cdo was the first RM united to be drafted to Northern Ireland. Army Commandos joined 3 Cdo Bde as gunners, engineers, specialists and technicians.” (van der Bijl & Hannon, 1994, p.4). Commando Training Centre at Lympstone; but now all recruits-including – Junior Marines aged between 16 and 17 1/2 – join at Lympstone.” (Fowler, 1984, p.22). “In 1971 the Commando Logistic Regiment (Cdo Log Regt) was formed.” (van der Bijl & Hannon, 1994, p.4). “In 1971, 59 Field Squadron RE was converted to 59 Independent Commando Engineer Squadron RE (59 Indep Cdo Sqn RE) and absorbed into the 3 Cdo Bde order of battle; attached is 131 Indep Cdo Sqn RE(V).” (van der Bijl & Hannon, 1994, p.27; restated on page 52). Although van der Bijl and Hannon (1994) and Fowler (2009) state that Army Commandos were reestablished in 1962, the UKs Ministry of Defence (MOD) (via a FOI request) tells us that the first AACC was not delivered until 1972. This first AACC comprised 8 Officers and 29 SNCOs, JNCOs and soldiers from the Royal Artillery, Royal Engineers, REME, RAOC (now part of the RLC), and Naval Personnel. There were also 2 officers and 15 NCOs from the (then) Imperial Iranian Navy. The Fairburn Sykes Commando dagger was first produced in 1941 by Wilkinson Sword. It was designed as a thrusting weapon and conceived by William Fairburn and Eric Sykes who, during their time in the Shanghai Municipal Police, developed an unarmed fighting system for use in combat that was taught to the Commando Units during WW2. The daggers iconic shape is synonymous with Commando Forces across the world although it is no longer standard issue for UK Commando Forces. Some are still issued dependent on training and the operational requirement. Readers may find the following website of interest: http://www.sheffieldcollectableknives.com/the-history-of-the-commando-knife. The aim of the AACC is to prepare Royal Navy (RN), Army and Royal Air Force (RAF), and selected foreign, personnel for service with 3 Commando Brigade RM by developing the temperament, mental resolve, physical robustness and core military skills necessary in the demanding environment of expeditionary and littoral operations. Dr Lara Herbert, then a Royal Navy Lieutenant, is the second woman to complete the All Arms Commando Course, and the first to complete in one go. In accordance with current Government policy on the employment of women in the UK military, service in the Royal Marines is only open to male volunteers. However, appointments do exist for women within the Army units that support 3 Commando Brigade and as such women can apply for the AACC. In 2001, three women volunteered for the AACC but unfortunately none completed the course. In June 2002, one of those women, the 5ft 4in Captain Philippa ‘Pip’ Tattersall of the Adjutant General’s Corps, aged 27, became the first woman to complete the AACC. She completed the course on her third and final attempt, finishing the 30-miler with five minutes to spare (Cramb & Smith, 2002). Dr Lara Herbert, an RN medical officer, “became the first woman to pass the All Arms Commando Course in one attempt” (Herbert, 2011, p.6) and the second overall. Other women who have attempted the AACC include: RN Lieutenant Katy Bray failed in week five; REME Army Captain Claire Philips, age 28, failed in week two; and REME Army Lance Corporal Joanna Perry, aged 29. There is a presumption that personnel who volunteer for the AACC will become, or develop into, very good team players. And, although there is an element of individual work required the emphasis is on team cohesion and teamwork. Stronger team members are expected to aid weaker team members through knowledge development, encouragement and camaraderie; though only to a point. If an individual is unable to pass the formative (criteria) tests and/or it is obvious they are unable to cope with the stress (physical and mental) of the course, after remedial work and a period to demonstrate improvement, the individual will be subject to RTU (returned to unit) procedure. Commando training is designed to test personal and team motivation to the point where actual operations present challenges that candidates will be able to overcome. The argument being that there is no point in suffering doubts at 0300 hours, in the silence of a tactical operation, after a helicopter or landing craft has dropped you off in or around enemy lines. A sense of humour is the key to the AACC. Candidates are not expected to be superman; they just need the above to pass the course. Like most training courses in the UK military, the AACC has a policy of ‘train in’ rather than ‘select out’. 1 RIFLES are a Light Role Infantry Battalion, a unique role within the infantry. They are currently part of 160 (Wales) Brigade, the only Regular Army unit, having previously been an element of 3 Commando Brigade. For approximately 5½ years – from 01 April 2008 to late 2013 – 1 RIFLES was permanently attached to 3 Commando Brigade, where it served as one of 3 Commando Brigade’s four manoeuvre battalions/units alongside the three commandos of the Royal Marines. The Battalion worked extensively with the Royal Marines on operations in Afghanistan. Several Riflemen capitalised on other opportunities during the Battalion’s time with the Commandos to complete amphibious training at Company level, mountain and arctic warfare training and the AACC. 3 Riflemen won Commando Medals (Section 4.8) which are awarded for the student on each Commando course whose performance and attitude best embodies the Commando ethos. The AACC is the only recognised route for regular members of the UK military outside of the RM to become Commando trained. The AACC is open to male and female officers and other ranks of the UK, except for RM recruits who undertake the 32-week RM recruit course. Captain Philippa ‘Pip’ Tattersall, the first woman to pass the course, never actually served with any commando units. Joshua Tibbles, of the Royal Australian Navy, successfully completed the AACC in 2013 but will not directly serve with UK commando forces. Joshua undertook the AACC as part of the revised Exercise LONG LOOK programme (Pine, 2013). Major General Kenrick Maharaj, currently Chief of Defence Staff of the Trinidad and Tobago Defence Force completed his AACC in 1985. All officers and other ranks can apply for the AACC after they have completed all Phase 2 (employment) training associated with their career employment group (CEG or Service equivalent). The AACC is different to the 32-week course that Royal Marine Commandos must pass. The 32-week course takes civilians and converts them into Royal Marine Commandos. In contrast, the AACC takes fully trained personnel and provides them with the skills necessary to become Army/Navy/Air Force Commandos who are then eligible to work alongside RM Commandos. Candidates, both officers and other ranks, must have completed a number of tests (see relevant Defence Instructions and Notices (DIN) and Section 4.2) in the three months prior to the Pre-Commando Course (Section 3.4). The unit Commanding Officer (CO) and Medical Officer also need to approve a candidate’s application. There is no compulsory requirement for Commando trained personnel to serve with Commando forces. However, it generally accepted that, for example, Royal Engineer candidates will serve at least one tour (usually 3 years and immediately after AACC) with the relevant Commando unit, in this case 24 (Commando) Engineer Regiment. All officers and other ranks over the age of 18 who have completed Phase 2 training are eligible to apply for the AACC. For serving members of the Regular Army, RN and RAF there is no upper age limit for applying for the AACC, subject to the medical and fitness criteria. Theoretically, at least, personnel can apply in the last year of employment. In 2003, “at the age of 55”, Captain Norman Fox became the oldest person to successfully complete the AACC (Regimental Gazette, 2003, p.44). Norman had previously completed 30 years in the Parachute Regiment. Norman completed the Reserve version of the course, the RFCC (Section 4.10). He has raised over £20,000 for the Pancreatic Cancer Research Fund. David with his son, Harry aged 20, and three military friends aimed to complete the 30-miler in 12 hours but ended up completing the course in 8 hours 20 minutes. Candidates should have a minimum medical classification as per JSP 950 ‘Medical Policy’ (published 01 April 2011, formerly JSP 346). Candidates should also refer to the relevant DIN as published by the Sponsor Branch (CTCRM). The AACC is the selection and training process for non-RM candidates wishing to become Commando-trained and subsequently serve in Commando units. There are currently three courses a year and Commando aspirants are allowed no more than three attempts to pass the AACC. Most of the candidates on the AACC will be members of 24 (Commando) Engineer Regiment, 29 Commando Regiment Royal Artillery or the Commando Logistics Regiment. However, there will also be small numbers of foreign (particularly soldiers from the Royal Netherlands Marine Corps which the RM has a close affiliation), RN medical and RAF Regiment personnel. Candidates will also find a mix of other British Army cap badges such as REME (Royal Electrical and Mechanical Engineers), Infantry, Royal Military Police, and the Army Medical Services etc. Since their conception in 1940 Commando forces and their training programmes have undergone a number of iterations. The modern AACC syllabus has undergone a number of changes since 2000, although most changes have occurred between 2011 and 2013. These changes have predominantly affected the preparation phases of the AACC, i.e. training packages that occur prior to the course proper. One of the main reasons behind these changes has been the desire to increase the pass rate, which in the past has dipped well below 50%. Figure 1 outlines the AACC syllabus as at December 2013. Prior to the evolution of the CCC/PCC, the AACC resembled Figure 2. Briefings (or FAM, familiarisation visits) are provided to training and regimental units which are designed to inform Commando aspirants about service with Commando forces. Furthermore, certain Army Commando units sponsor individual training courses designed to assist individuals with their personal preparation. It is important that candidates attending the AACC ensure they have ‘adequately’ prepared themselves, both mentally and physically. Although passing the AACC is the goal of all candidates, how each candidate trains to achieve this goal will be different. Finally, candidates should ensure that they are competent in basic map reading, navigation and first aid. In particular candidates must be fully familiar with the prevention and first aid treatment of climatic (heat and cold) injuries. Candidates should also be proficient in the operation of personal radio communications systems (currently, PRC 354 and PRC 355 Bowman man-pack radios). 29 Commando Regiment Royal Artillery, 24 (Commando) Engineer Regiment and the Commando Logistics Regiment each sponsor a Commando Conditioning Course (CCC), formerly known as the ‘beat-up’ which is now designed to be a developmental and conditioning package rather than a ‘beasting’. The CCC is an optional course, but Commando aspirants are strongly advised to attend. The 4-week CCC run by Achnacarry Troop 24 (Commando) Engineer Regiment is held at Royal Marines Base (RMB) Chivenor, Barnstaple in North Devon (Kellgren-Parker, 2013). The purpose of the CCC is to condition individuals to the physical and administrative rigours of Commando training. 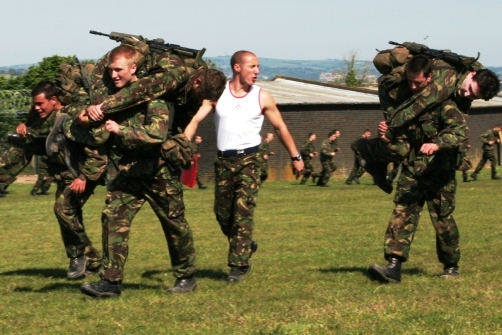 As a result, the progressive training package focuses on physical fitness and robustness, military skills (including basic navigation and field admin) and Bottom Field Assault Course techniques. All aspirants are expected to arrive able to pass their fitness (MATT 2) tests, plus complete five over-arm heaves, a 30ft rope climb and pass the Military Swim Test. The course is not compulsory but assists in preventing injury and has helped to increase the pass rate. 24 (Commando) Engineer Regiment was due to be disbanded under Army 2020 reforms but has since been reprieved, albeit at a reduced manpower level (BBC News, 2014). Personnel who wish to serve with 29 Commando Regiment Royal Artillery (RA) will spend up to 8-weeks at Okehampton, Devon, developing their physical stamina, strength and mental robustness before being sent on to attempt the AACC. It is a mandatory requirement for all AACC aspirants to pass a Pre-Commando Course (PCC) prior to attendance at the AACC. The PCC is run in the 5-weeks preceding the AACC and is designed to bring personnel from a broad range of backgrounds up to a common standards of basic skills, and as such ensure that all candidates are at an adequate standard of fitness and preparedness prior to commencing the AACC. The first 4-weeks are based at RMB Chivenor, exercising on Braunton Burrows Training Area and Dartmoor. The final week is held at CTCRM and its purpose is to ensure that all candidates are at the correct standard. 24 (Commando) Engineer Regiment, 29 Commando Regiment RA and the Commando Logistics Regiment sponsor the PCC. All candidates for the PCC will receive a combined joining instructions and course preparation handbook which outlines, for example, the training programme that candidates will undertake. It provides advice on accommodation, car parking, dress, food, equipment to bring and not to bring (space is at a premium), a generic fitness training programme and a number of other useful titbits of information. Dates of all PCC/AACC courses covered in this article are published annually in the relevant DIN (currently DIN 2015DIN07-115 Instructions for the All Arms Commando Course). Alternatively course dates can be obtained from the Commando Training Wing, CTCRM or the relevant Training Wing of one of the Regiments noted in Section 3.3 above. Those candidates who pass PCC will move immediately on to the 8-week AACC (Kellergren-Parker, 2013) which is carried out under the auspices of the Commando Training Wing and is conducted in two phases. Phase 1 of the AACC (Weeks 1-4) is an Infantry Skills phase and contains the bulk of the military skills and fitness training in preparation for Phase 2 in Weeks 5-8. Phase 2 incorporates amphibious, vertical assault and helicopter training, culminating with a Final Exercise and Commando Tests. As the weeks pass, candidates will spend progressively longer periods in the field. Eight Corporals (OR-4, Section Commanders); six Royal Marines Corporals, one Royal Engineer Corporal, and one Royal Artillery Bombardier. The course PTI (Physical Training Instructor) is a Commando trained Staff Sergeant (OR-7) or Sergeant (OR-6) from the Royal Army Physical Training Corps (RAPTC). This phase of training focuses on core military skills such as field craft and tactics (patrolling, defence, and section and troop level attacks). This phase also delivers and assesses health and hygiene, map reading, navigation and weapon handling (skill at arms). Fitness is also developed through progressive training (i.e. longer distances and heavier packs). Information is also provided on the organisation and role of Commando forces. Five (overhand grip) pull-ups (chin to a horizontal bar). A 1.5 mile run in 15 minutes as part of a squad immediately followed by an 1.5 mile individual run in under 11.5 minutes (all on road and in boots). Weapon Handling Tests (WHT): pass WHT on personal weapon to a skilled standard on joining the course. Multi Stage Fitness Test (MSFT or Bleep Test): the National Coaching Foundation Progressive Shuttle Run Test for the prediction of maximum oxygen uptake is a shuttle run at increasing speed, dictated by a bleep signal. Wearing training shoes, PT t-shirt and shorts all age groups must achieve Level 11. 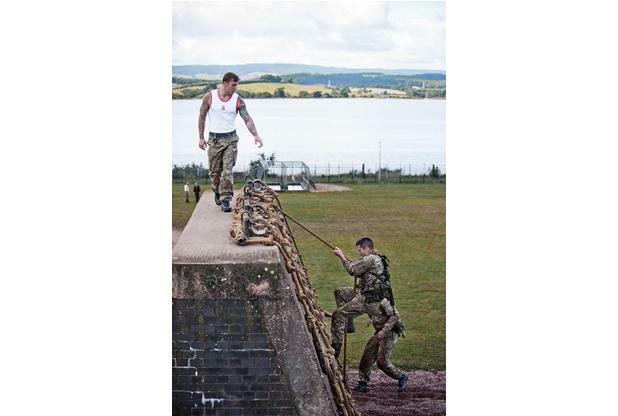 30ft Rope Climb: all age groups must be able to climb a 30ft rope in boots with webbing weighing 7kg (15lbs) and carrying personal weapon (currently the SA80, 9lb). The ‘Scissor’ method is the only method accepted when rope climbing at CTCRM. Pass Combat Fitness Test (CFT): within 1 month of joining course. For those candidates who successfully complete the passing-in tests on day one (yes some do fail), they will at some stage in the afternoon visit the theatre and receive a welcome to the course from the Commandant CTCRM or his deputy. The Wet/dry routine is a system the Royal Marines use to make sure they always have a dry set of clothes when operating in field conditions and is particularly important when the weather is cold. To ensure that personnel keep a set of dry clothing, whenever they are out of their sleeping bag to conduct a sentry or duty, they put on their wet rig (clothing) back on; this ensures personnel always have a dry set of clothing to sleep in. Most people do not enjoy doing this routine but it is a sign of professionalism and may save your life one day. 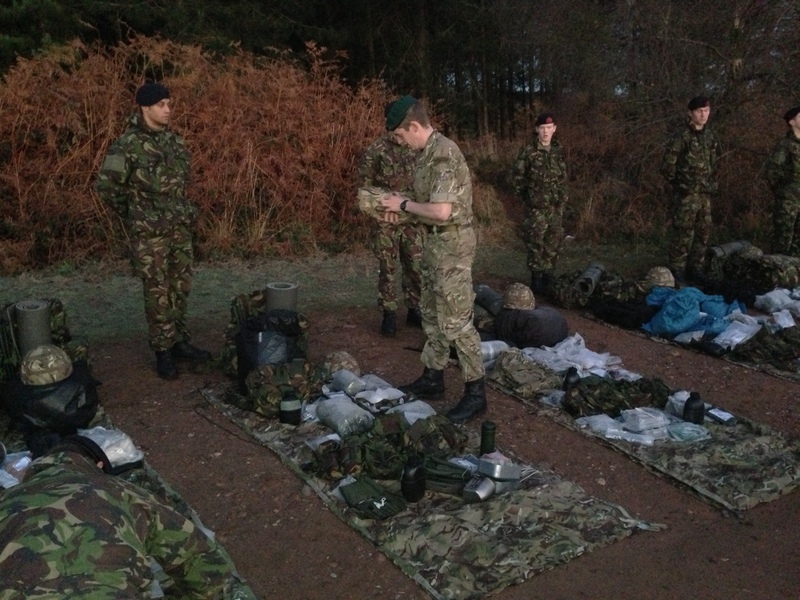 Each morning on exercise candidates have to complete a kit muster (i.e. layout your kit for an inspection). Every single piece of equipment (including your rifle stripped down) from your Bergen (rucksack) and webbing must be placed on top of your poncho (shelter) (Figure 3). Each piece of equipment must be presented in a clean and serviceable condition. Although instructors give verbal correctional advice, disciplinary measures are given for those trainees who fail to achieve the appropriate standard (e.g. forward rolls in the mud followed by burpees). 30 foot (9m) rope climb: no time limit (but expected to be completed in a few minutes). Bottom Field assault course: 5 minutes for recruits and AACC, and 4.5 minutes for RMYOs. 200 metre fireman’s carry: 90 seconds for recruits, AACC and Royal Marines Young Officers (RMYOs) carrying partner and their equipment and rifle. Full regain: over the water tank and no time limit (but expected to be completed in a few minutes). Candidates must also successfully pass the Battle Swimming Test: enter water from height, breast stroke 30m, remove webbing (10lb, 4.5kg) plus rifle (9lb, 4.1kg)) and tread water for remainder of 3 minutes. 4-mile (6.4km) Speed March: as a formed body carrying rifle (9lb) and equipment (21lb, 9.5kg) in 40 minutes for recruits, AACC and RYMOs. 6-mile (9.6km) Speed March: as a formed body carrying rifle (9lb) and equipment (21lb, 9.5kg) in 60 minutes for recruits, AACC and RYMOs. 12-mile (19.3km) Load Carry: as a formed body carrying rifle (9lb) and equipment (70lbs, 31kg) at night as a formed body within 4 hours and 40 minutes for recruits, AACC and RMYOs. This phase of training focuses on helicopter drills, sea survival, rope assault techniques, raiding craft drills and amphibious warfare which are typically conducted during weeks five and six. The final exercise is typically conducted during week seven and tests basic military tactics (i.e. map reading, amphibious skills, endurance and stamina). The Commando Tests are conducted during week eight, ‘Test Week’. The four commando tests, which come towards the end of training, are the final proof that individuals are ready for their green beret – and to start their career as a Royal Marines Commando, continue RMYO training or graduate from the AACC. Speed March: this six-mile (9.65km) march had to be completed in 60 minutes carrying a rifle and equipment, and finished at a rifle range with a marksmanship test. Endurance Test: a four-mile (6.4km) run with a rifle and equipment over bog and rough country, overcoming obstacles and crawling through tunnels, one filled with water. This test had to be completed within 80 minutes and finished at the rifle range, where marksmanship had to be proved. Assault Course: this was over varying obstacles, carrying a rifle and equipment, and had to be completed in five minutes. Twelve-mile (19.3km) Cross-country March: this was undertaken carrying 90lb (40.8kg) of equipment. A six-mile (9.65km) Speed March: 60 minutes for RMYOs, recruits and AACC. A nine-mile (14.4km) Speed March: 90 minutes for RMYOs, recruits and AACC; followed by a troop attack exercise. The Endurance Course, plus a four-mile (6.4km) run back to camp: 73 minutes for recruits and AACC, and 70 minutes for RMYOs. Trainees would finish by firing on the 25-metre range. The Tarzan Course: 5 minutes for recruits and AACC, and 4.5 minutes for RMYOs. The Tarzan Course and Assault Course: 13 minutes for recruits and AACC, and 12.5 minutes for RMYOs. A 30 foot (9m) Rope Climb: although there was no time limit it was expected to be completed in a few minutes. A 30-mile (48km) ‘YOMP’: 8 hours for recruits and AACC, and 7 hours for RMYOs. Battle Swimming Test: no time limit. The trainee jumped into the pool wearing full kit, swam for 50m (164ft), trod water for 2 minutes, took off his kit and handed it to a trainee on the side of the pool, and trod water for another 2 minutes. At no time could the trainee touch the side of the pool. mile (9.65 km) course carrying personal weapon and equipment. The first two miles (3.2 km) consist of undulating woodland terrain featuring obstacles such as tunnels, pipes, streams, bogs, wading pools, and an underwater culvert. These tunnels include a short underwater tunnel called the sheep dip and an extremely narrow tunnel called the smartie tube. The latter four miles (6.43 km) remain an obstacle free metalled road return run back to CTCRM. This is followed by a marksmanship test where the recruit must hit 6 out of 10 shots at a small 25 metre target (simulating a range of 200 metres). Candidates must achieve 6 out of 10 shots on target or re-do the whole test! The endurance course is run in groups of 3 and the 4-mile run back to camp is solo. The time limit is 73 minutes for recruits and AACC, and 70 minutes for RMYOs, with equipment weighing 9.6kg (22lb) and personal weapon. Starting at 1 minute intervals on the commando slide, this is an individual test that commences with a number of High Aerial Apparatus (high ropes) followed immediately by the Bottom Field Assault Course, and then finishing with a rope climb up a 30 foot near-vertical wall. It must be completed whilst carrying fighting order and personal weapon in 12.5 minutes for RMYO’s and 13 minutes for recruits and AACC. Candidates complete the course carrying personal and equipment weighing 9.6 kg (22 lb). Watch: http://www.youtube.com/watch?v=UEygmSm91AA for a bird’s eye view of the Tarzan course. This is a 9 mile (14 km) speed march, as a formed body. It is to be completed in 90 minutes (for recruits, AACC, and RMYO’s) at an average pace of 6 miles per hour whilst carrying personal weapon and equipment weighing 9.6 kg (22 lb). A march, ‘YOMP’, across Dartmoor to be completed in 8 hours for recruits and AACC (with Staff directing/navigating), and 7 hours for RMYOs (directing/navigating for themselves). Wednesday: retests as required in the following order: 9MSM; endurance course; Tarzan aerial assault course (2nd retest); and 30-miler. Candidates who require retests may end up conducting them solo, notwithstanding the PTI. The new ‘Sheep Dip’, part of the Endurance Course, is given the OK by a member of 131 Commando RE (Sapper, 2014a). At the heart of the Endurance Course is the water tunnel or ‘Sheep Dip’. It consists of two 1.8m long, 600mm diameter tunnels that commando trainees must go through working in teams of three, taking it in turns to push and pull each through, all done whilst wearing webbing leaving very little in the way of excess room for manoeuvre. The obstacle had been in position for decades and was in need of refurbishment. The 30-Miler is a tactical navigation endurance march with each candidate carrying their personal weapon and equipment. It commences at Okehampton Camp, Dartmoor National Park (across Dartmoor Training Area, DTA), Devon and finishing at Shaugh Prior Bridge, a location near Plymouth Airport. Training conducted at Achnacarry during WW2. The aim of the 30-Miler is a fast paced march which simulates a commando extraction from a target to a seaborne pickup point. Each course is divided into syndicates of 8-12 candidates who are accompanied by a member of staff, usually their section commanders. Candidates will receive a safety briefing and motivational pep talk before setting off from Okehampton Camp on a mixture of tracks and open moorland at an average of four miles per hour (mph) for recruits and AACC and 4.3 mph for RMYO’s. Each syndicate will generally set off at 10 minute intervals. The march is divided into six legs, with 4-6 check points. The first checkpoint is approximately 12-miles in. At each check point candidates refill a fresh water bottle and are given a large metal mug of sweet flavoured water and a banana. At check point two, candidates are also given a pasty. Between them candidates carry their ‘safety stores’ or emergency kit. Each is bearing a weight of around 40lbs. How long it takes syndicates is weather dependent, finishing with 15 minutes left on the clock is not uncommon; as it is a team effort syndicate’s travel at the speed of the slowest member (there is an expectation that team members will support each other in the essence of the Commando Spirit). At the end of the 30-miler, the finale of their training, candidates who have passed all tests will be presented with their Green Berets. Speed Marching: speed marching is an important element of commando training. Commando operations will often require rapid movement to and from the objective. Speed is an essential weapon for commando units which can offset their numerical or material inferiority by the surprise created by arriving suddenly at unexpected times and places. Consequently, from the 1940s commandos have always emphasised the need for marching. In training at least, speed marches are not tactical exercises. They are conducted in a manner which would be impossible if the enemy were in the vicinity. Troops march along roads with no concern for their exposure to enemy fire. Rope Work (Tarzan course & 30 foot Rope Climb): rope-work is designed to test the courage, agility and determination of trainees. There was a direct operational reason for their original inclusion in the course. On operations in the Second World War, commandos carried with them a six foot rope with a toggle and loop on it. These toggle ropes could be strung together and used to scale cliffs or cross rivers and they were in fact used for these purposes in the course of campaigns in the Second World War. It was essential that prospective commandos be adept at their use. Rope-work also assists the commandos operationally in another way. Further, rope-work is intellectually important. It opens up the potential for different kinds of movement over and across spaces which are initially deemed impassable. Endurance Course: The endurance course requires total immersion and the crossing of several pools, one of them chest deep in winter. On the bottom field, many trainees fall into the tank on failed regains and the tank itself has become a standard disciplinary measure. Trainees are immersed frequently in training and although immersions do not strictly improve the physical fitness of the trainee, immersion in cold water is one of the most effective ways of undermining human morale. Being cold and wet is, or can be, an extremely demoralising experience. Consequently, although not directly contributing to the fitness of trainees, the immersions which they endure develops and tests fortitude. The tank and the water tunnels are an important way of instilling this fortitude. 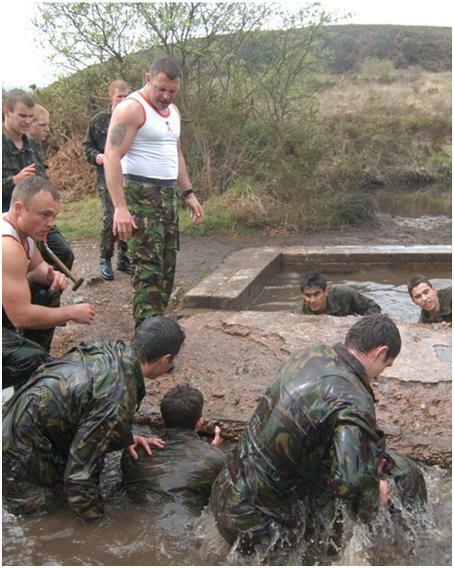 Since they are likely to be cold and wet on amphibious or mountain operations, trainees must be inured to it at CTCRM. Commando Medals are awarded for the student on each Commando course whose performance and attitude best embodies the Commando ethos. The Commandant’s certificate is awarded to the student who, in the view of the training team, displays enthusiasm and commitment to an outstanding standard, irrespective of rank. The Reserve Forces Commando Course (RFCC) is for Army Reserve and Royal Marines Reserve (RMR) AACC aspirants who are under the age of 42; although the December 2014 issue of The Sapper (p.738) states the age limit is 35. Reservist recruits normally train near their home unit but then come together to conduct concentrations where key assessments are carried out. Recruits from each of the four RMR and Army Reserve units will gather at CTCRM for the intensive two week RFCC package to complete their Commando tests. Those transferring in from other reserve units looking for the challenge and excitement that working with a Commando unit can bring. Non-Commando ex-regulars and transferees from other units will typically join their Commando unit at the Commando Training stage, alongside other Reservist newcomers who have just completed their Phase 1 training. A 6-8 month package will be delivered by the unit over weekends, training nights and in the individual’s own time, culminating in the 2-week RFCC at Lympstone. The RFCC will broadly follow this outline. The first day of the RFCC is spent revising the Tarzan and Endurance course. The course will then deploy onto the final exercise (with packs weighing over 80lbs; 3-days rations, water, ammunition and radio batteries) which commences with a Mountain Leader led cliff assault package before a tactical night time forced march on Dartmoor. During the final exercise the RFCC candidates will also conduct advance-to-contacts, moving tactically on a compass bearing until candidates encounter enemy forces before conducting troop attacks on the enemy positions. The exercise will also include RFCC candidates being moved by helicopter across the moor and on the final night will be inserted into Cornwall by raiding craft and carry out an attack on a fort. After a brief pause following the final exercise RFCC candidates will then move on to the Commando Tests (Section 4.5). The tests on the RFCC are done in the same times and conditions as the regular RM and All Arms courses. The main difference between the AACC and the RFCC is the fact that the Reservist will have to balance this with their civilian employment, so a lot less time is spent on the exercise phase compared with the AACC. Having passed all this, the candidates are now Commandos. However they have not completed Reservist training as they still have to complete Phase 2 of their course (for ex-Regulars or current Reservists this is only required if changing trade). This includes a week of live firing on Dartmoor, and close quarters battle (CQB) training. These elements are usually conducted with the trainees attached to regular RM recruit Troops. Candidates also have to complete survival training and a short amphibious exercise. Only on successful completion of the course will candidates receive the coveted green beret and the distinctive Commando flash, and be eligible for service within 3 Commando Brigade and other Commando units. The Commando Training Wing trains all Royal Marines Recruits, as well as Reserves and the initial training for all Bandsmen and Women. 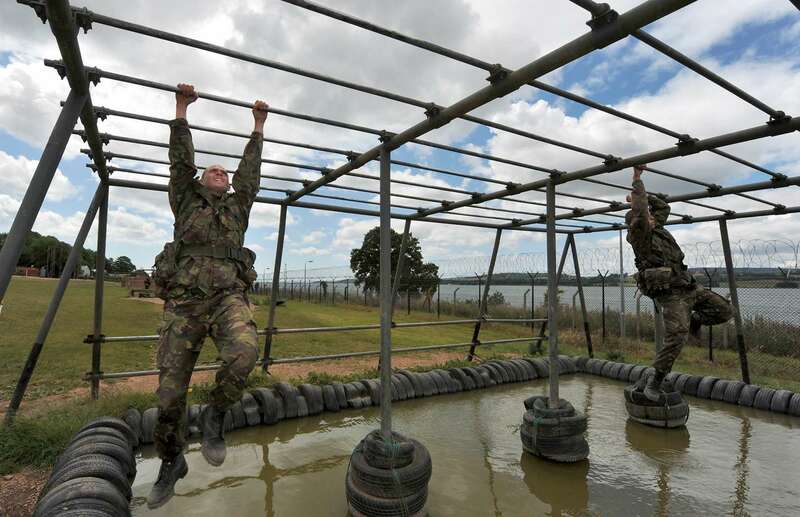 The Commando Training Wing is also responsible for running the All Arms Commando Course (AACC) which selects and trains Servicemen and Women from the other three services, and occasionally from abroad, to be able to serve alongside the Royal Marines anywhere in the world. The Dartmoor Training Area is part of the Dartmoor National Park administered by the Dartmoor National Park Authority (DNPA, 2006). View Section 6.7 (Useful Links) for further information. The 30-miler is across Dartmoor National Park starting from Okehampton Camp, Devon, on a mixture of tracks and open moorland at an average of four miles per hour, to a location near Plymouth Airport. Woodbury Parish, which incorporates the villages of Woodbury, Woodbury Salterton and Exton, is currently one of the largest parishes in Devon. It encompasses much of Woodbury Common which is situated adjacent to the village of Woodbury, Devon, and is an area of common land that is predominately heath land. The common contains a training ground used by CTCRM (approximately 4-miles away) for the endurance course for recruit, RMYO and AACC training. The AACC is open to all officers and other ranks of the UK military. Commando units seek to attract determined, highly-motivated, intelligent, reliable and physically fit individuals to serve with Commando forces. This article provides the basic information to allow individuals to make an informed judgement before applying for the AACC. Officer candidates are accommodated and eat in the Officers’ Mess, whilst other ranks (of all levels) will be accommodated in the block opposite the Officers’ Mess, next to the drill square. Senior NCOs are accommodated separately, first on the right as you go in. There is a small NCO room second right for those who are quick enough, otherwise two large rooms, left and right, at the end. Don’t expect much privacy in the rooms. Candidates share bunks beds and have one wardrobe, and top box for their equipment (this is to simulate life onboard a ship where space is a premium). There are only three sinks and showers in the big rooms for 35ish people, and typically minus the show curtains. Course officer and instructors’ rooms are first left. Other ranks (of all levels) eat in the Regimental Restaurant with the nods (RM recruits); AACC candidates are warned to keep away from the nods. A course programme is usually located on the notice board so candidates can view the ‘lovely’ training evolutions awaiting them. Washing facilities (for clothing) are centrally located within CTCRM, with about 100 washing and drying machines (though not all work!). A military phone is available for AACC candidates in the hallway between the two large rooms. First thing in the morning and immediately after lunch candidates will be inspected by their section commander outside the accommodation block. Heaves for those who fail! Room inspections are not normally conducted, unless the place looks like an absolute pig sty; in which case standby. High standards of personal administration are expected by the Royal Marines, and candidates will be RTU if they fail to achieve the standard. Ideally, take with you two pairs of ‘broken in’ boots. A 12-mile loaded march with new boots is not funny. Being prepared is not just about fitness training. Personal administration (admin) is a big part of the course. A number of candidates on each AACC turn up inadequately prepared and are an admin vortex (i.e. not very good!). As many candidates fail because of an inability to carry out simple, and often basic, and routine personal admin tasks as candidates who fail the physical tests. The fitness aspect of the AACC is hard enough as it is without ‘volunteering’ to go on the flank (quick, short ‘beasting’) because a candidate cannot wash, shave, eat, clean and maintain their kit and clean a personal weapon ready for a field inspection (Section 4.4). The introduction of the mandatory PCC should reduce the incidence of this to virtually zero. Candidates should brush up on their map reading skills, such as: map to ground appreciation; locating features that are on the ground to your front on a map; intersection and re-section; relief, basic route cards; and bearing and pacing. All the navigation is done solo carrying equipment (9.6kg, 22lb) and personal weapon, and mostly at night. Woodbury Common is full of Babies-Heads so candidates do not want to be getting lost and snapping their ankle. I would suggest that if an individual is going to conduct fitness in boots as part of their training programme, then do most of your running on grass which will reduce the incidence of stress injuries. Most of the speed work (heart and lungs) that candidates conduct on the course will be on the ‘Bottom Field’, candidates will soon learn to cry at the thought of the three hour session that awaits them nearly every morning during the first phase of the course. The road stuff is nearly all speed marches (carrying equipment and personal weapon at 10 minute mile pace) and load carry’s (at 20 minute mile pace), but they are usually faster than that, though never question it or you may end up doing it again. The RM instructors do not like candidates weighting their kit down with weights; it usually always has to be kit. However, do not worry too much, as other than on the bottom field the instructors rarely weigh bergans as they know that, with the mandatory kit list, food, ammunition, water and other delightfully heavy equipment, candidates will be well over the prescribed weight anyway (remember kit muster). 131 Commando Squadron (V) (Army Reserve affiliated with 24), officially “…third squadron from 1 October 2015.” (Sapper, 2014b, p.36). The Channel 4 documentary ‘Royal Marines Commando School’ which first aired on Monday 14 July 2014, over eight episodes, will provide AACC aspirants with an insight to the Tactics, Procedures and Protocols (TTPs) as well as the fitness and administration that will be encountered on the AACC. van der Bijl, N. & Hannon, P. (1994) Elite 057: The Royal Marines 1939-93. London: Osprey Publishing Ltd.
Chappell, M. (1996) Elite 64: Army Commandos 1940-1945. London: Osprey Publishing Ltd.
Sumner, I. (2001) Elite 079: The Royal Navy 1939-45. London: Osprey Publishing Ltd.
van der Bijl, N. (2006) Elite 142: No.10 (Inter-Allied) Commando 1942-45. London: Osprey Publishing Ltd.
Fowler, W. (1984) Men-at-Arms 156: The Royal Marines1956-84. London: Osprey Publishing Ltd.
Fowler, W. (2009) Warrior 137: Royal Marine Commando 1950-82: From Korea to the Falklands. London: Osprey Publishing Ltd.
Read the 2011 document ‘The Royal Marines Vision: Think Commando’ which explains the role and force of 3 Commando Brigade following the SDSR @ http://www.royalnavy.mod.uk/About-the-Royal-Navy/~/media/Files/Navy-PDFs/About-the-Royal-Navy/Royal%20Marines%20Vision.pdf. [Accessed: 17 February, 2014]. BBC News (2014) 24 Commando Engineer Regiment Saved from Cuts. Available from World Wide Web: http://www.bbc.co.uk/news/uk-england-devon-26985930. [Accessed: 14 July, 2014]. Cramb, A. & Smith, M. (2002) First Woman Wins Marines’ Green Beret. Available from World Wide Web: http://www.telegraph.co.uk/news/uknews/1395974/First-woman-wins-Marines-green-beret.html. [Accessed: 23 December, 2013]. DNPA (Dartmoor National Park Authority) (2006) Military on Dartmoor. Available from World Wide Web: http://www.dartmoor-npa.gov.uk/learningabout/lab-printableresources/lab-factsheetshome/lab-factsheet-military-on-dartmoor. [Accessed: 14 July, 2014]. Herbert, L. (2011) Going Commando. Anaesthesia News. No.278 February 2011. Available from World Wide Web: http://www.aagbi.org/sites/default/files/ANews_Feb11-1.pdf. [Accessed: 16 July, 2014]. Kellgren-Parker, L. (2013) Commando Sapper Reunion. The Sapper. December 2013, pp.334-335. Mackie, R. (2014) Richard Mackie Latest Address. Available from World Wide Web: https://www.linkedin.com/pub/richard-mackie-latest-address/21/b99/b86. [Accessed: 09 December, 2014]. PCRF (Pancreatic Cancer Research Fund) David Smashes the 30-miler Commando Test for PCRF. Available from World Wide Web: http://www.pcrf.org.uk/news.php/151/david-smashes-the-30-miler-commando-test-for-pcrf?category=2. [Accessed: 09 December, 2014]. Pine, N. (2103) Boatswains Mate Excels on UK’s Royal Marine Commando Course. Available from World Wide Web: http://news.navy.gov.au/en/Aug2013/People/228/Boatswains-Mate-excels-on-UK%E2%80%99s-Royal-Marine-Commando-Course.htm#.VIgR5jGsU00. [Accessed: 09 December, 2014]. Sapper (2014a) ?Title. The Sapper: Journal of the Corps of Royal Engineers. October 2014, pp.X. Sapper (2014b) 131 Commando Squadron. The Sapper: Journal of the Corps of Royal Engineers. December 2014, pp.738. Fowler, W. (1984) Men-at-Arms 156: The Royal Marines 1956-84. London: Osprey Publishing Ltd. I always try to train me like as army or special force,those videos help me for my training and I am a software engineering, also a bodybuilder. I always want to know and learn new things, create new and powerful things.best of luck AACC. How to join me AACC? 2. A specially invited member of a foreign armed force. I will of course continue to research this as I obviously do not want to be the perpetrator of incorrect information. I will keep you posted on any further developments. Thanks and very bizarre. Maybe Navy Command has no organisational memory of that period due to changes/amalgamations etc. It would be extremely hopeful to think that someone was still serving from that time period. I have some sources I might be able to tap, but otherwise will get back to the FOI process. Have to agree with the dearth of documentation/publications; lots about Army Commandos in WWII and RMs post-WWII to present, but lacking on CS/CSS Commandos post-WWII. I have been seeking to document the history of the AACC and the reasoning behind it. I was under the impression that after the conflict in S./E. Asia (not sure whether this was Borneo or Malaya) but the RM’s were expected to be there for about six months but ended up being there for about three years. They obviously could not support themselves for that length of time and relied heavily on the support arms of the army. It was decided in 1962 that the RM’s needed heavy weapon support and 29 and 95 Regt’s Royal Artillery became commando units and in 1964(not 1972 as stated in your article) the first AACC took place. It was sometime after that, that 59 Indp Sqn RE joined 3Cdo Bde. Please can this be confirmed or rejected. Many thanks. P.S the whole article made brilliant reading. My information is direct from the MOD (Navy Command), via a FOI request sent in November 2015, in which they state that the AACC was introduced in 1972. I have to admit that I haven’t researched the history of the Army units, but if they became Commando units in 1964 it would be interesting to know what course/curriculum/training programme they followed, if any! 1. What was occurring between 1964 and 1972? 2. Army in-house training which then came under the aegis of the RMs? 3. Did the units come under the operational command (OPCON) of 3 Commando Brigade but not required to do any Commando training? In 1969 non RM underwent 5 weeks training at Lympstone having spent (in my case 4 weeks ) at the Citadel Plymouth. Total course 9 weeks. Lympstone was called ITCRM eg infantry training centre Royal Marines and courses were mixed entry eg RM recruits and RN and Army serving soldiers. Non RM joined the RM intake at about week 26 which was the start of RM commando training in X troop. My course was 897/40 which indicates RM recruit intake number 897 and non marine intake number 40 which happened to be 2x naval officers and 4 x army guys. Total course number was 33 ranks of which 6 passed on the first attempt eg got their green beret immediately after the 30 miler. Of the 19 army guys that started with me at the Citadel 3 got to Lympstone and of those three I was the only one that passed straight off. I was fortunate in that I had served with 29/95 Cdo in the far east for 2 years the other 18 hadn’t. The high failure rate was possibly the reason for the AACC structure that was put in place in 1972. All REME guys who passed where exempt 1st class MTC.